Last night at Alamo, 300 of us gathered to pay our final respects to Prince. Now, please don't be misled. I'm not some raging Prince fan. I'm just very sad he has passed, and thought it would be a meaningful send-off to see Purple Rain with lotsa fans as a thanks and tribute and final celebration of his life and times and tunes. It was a really beautiful evening. The pre-show (which amounted to a 30-minute video dance party and included Foxx's and Chappelle's impersonating skits) was, in and of itself, well worth the trip. After it, the evening became a surprisingly sedate, somber, even sobering affair. Reverential, one could say. Beginning, as it did, at 11pm, I expected a liquored and rowdy crowd. Instead, I got a memorial service at church. By the end, people were on their feet, swaying and waving those purple doohickeys that glow when you snap 'em to life. Men were singing at the top of their lungs and wives were crying in silence, tears streaming down their faces as they held their men's hands for comfort. I sat beside a forty-something suburban mom in khakis and blue jean jacket who had ventured out alone. A tiny thing, maybe 5' 1" including her poofy brown bob, she captured in one sentence how I felt. "I don't really know all that much about Prince, but I wanted to say goodbye." Though a few scenes in the film had us chortling (particularly the Elaine Benes fan-dancing and the moment Prince rushes into his kitchen, searching in anger for his father and spinning 360° like a tiny James Brown top; it's quite comical; soda shot from our noses), the rest of the movie really stands the test of time. And the music is as great today as it was then: electrifying and soulful. But back to foreshadowing, there is the treasure trove of music The Kid finds in the basement after his father is rushed to the hospital. Everyone anticipates voluminous posthumous releases by Prince's estate in the coming years; decades worth of songs, they say. Perhaps more than he released in his lifetime. Francis L., indeed. And there is also that turning point in the film when Prince hears his father, nearing rock-bottom with his wife, pleading, "I can make you…happy. If you just believe in me. Yeah, if you just believe in me. I will die for you." We eventually see The Kid's lot in life improve—mentoring the infamous Lisa and Wendy—realizing that otherwise he continues the sins of both his parents, one who is "never satisfied," and the other who is a perpetual failure bent on self-destruction by way of control, violence, and abuse toward his talented self, his entangled wife, and their sensitive, tormented son. Everyone in the triangle here is troubled, and always to musical oblivion. I had forgotten the moments of tenderness and emptiness and despair, and the beautiful piano solo played by his father, yet performed by Prince. He rips and tears every instrument he touches, grinds his Honda into the ground like Zorro on his trusty steed, and shreds both stage and screen again and again and again. 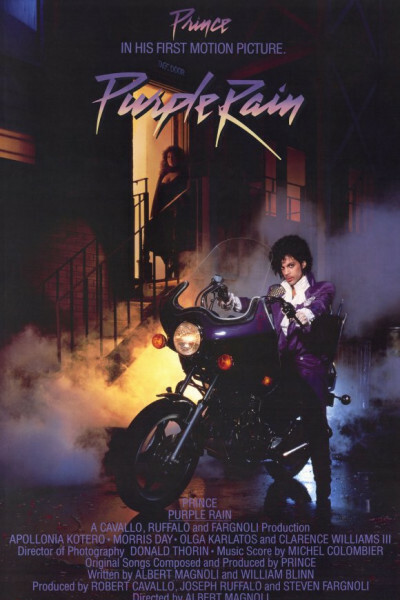 You may not recall, lo these many years later, but Purple Rain—made for just $7m—won the Oscar for Best Music (Original Song Score), the Grammy (Best Album, Motion Picture), the Brit Award (Best Soundtrack), and was nominated for a Golden Globe and four more awards that season. Out of nowhere, starring nobodies, in the thriving metropolises near Lake Minnetonka. Call it chance or happenstance; seems pretty destined to be if you ask me.